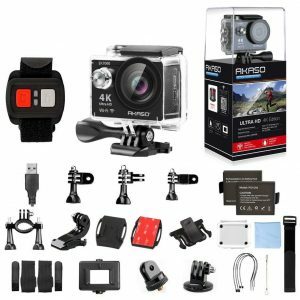 In this article we will talk about the best video camera for sports and we hope that you will find this AKASO ek7000 review useful . 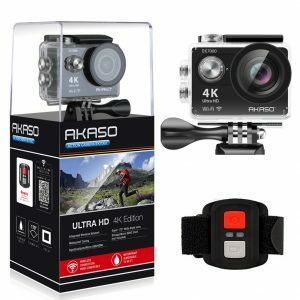 The AKASO EK7000 action camera is arguably the best budget-friendly camera you can get for less than $100. Although still shadowed by the likes of GoPro and SJCAM action cameras, you will be hard-pressed to find such bang for your buck anywhere else. This Amazon Bestselling waterproof camcorder can be your for just under $80, but don’t let the price fool you. With every purchase comes a generously stocked bag of accessories and add-ons for the camera and, as we will see in this review, a host of essential video recording and image capturing features. 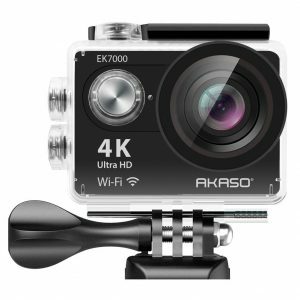 The AKASO EK7000 features a simple plastic build, which is a bit disappointing since action cameras get most of their use outdoors. Despite looking flimsy and cheap, however, the plastic case makes the camera waterproof for up to 98 feet underwater. The camera measures 60mm in length, 41mm in width, and is 30mm thick. Its basic rectangular layout consists of a large power button and lens on the front, a 2-inch display on the back, two navigation buttons on the left side, charging and data transfer ports on the right and a record or capture button on the top part. All the sides except the front and back of the camera are textured to enhance the grip and overall ergonomics. Meanwhile, its 2.6-ounce weight makes it quite light and easy to handle using one hand. The camera’s 170 degrees super wide-angle lens delivers 1080p 60 fps shots, 1080p 30 fps shots, and 4K 25 fps shots without much tinkering. The sensor captures 12 MP images that are crisp, full of natural colors, and very well-detailed. It is worth noting, however, that the camera’s performance suffers in low-light conditions. On the plus side, you get various shooting modes (single shot, time-lapse, and burst) to allow you to capture your adventures however you please. The EK7000’s sharp 2-inch LCD screen is one of its selling points. It is rare to find camcorders with such generously-sized displays under the $100 price point, so the sizeable screen is a welcome bonus. Other than allowing you to tinker with the video setting, the LCD screen gives you a preview of the images and live footage you record on your adventures. The camera comes with a MicroSD slot that supports class 10 MicroSD cards or higher of up to 64GB. You can easily connect to a secondary display using the micro-HDMI port on the right side and charge the camera using the mini USB port. All the required cables, save for the micro-HDMI cable, are provided. The camera is WiFi-enabled so you can pair it with your smartphone, or other mobile devices for better control. Since a remote control is among the accessories you can get when you buy the camera, this isn’t necessarily a big deal. However, it does allow you to wirelessly share pictures and videos with other devices or post them straight to your social media page. The EK7000 comes with two rechargeable 1050 mAh Li-Po batteries, each of which has a 90-minute battery life. This rating is far from ideal especially since you will only get 3 hours of footage at 1080p 60 fps before running out of juice on both batteries. Going for way less than $100, the AKASO EK7000 is an affordable entry level action camera. The camera comes with plenty of accessories at no extra cost. Decent video recording and image capturing capabilities. First of all the AKASO EK7000 goes for $75 on Amazon.com. In addition this package doesn’t include any storage devices then you may have to shell out an extra $25 if you want a class 10 64GB MicroSD, bringing the total cost to $100. Alternatively, you can get a free 32 GB SD card as a gift from the manufacturer by writing a review of the camera on Amazon and sending proof of purchase. 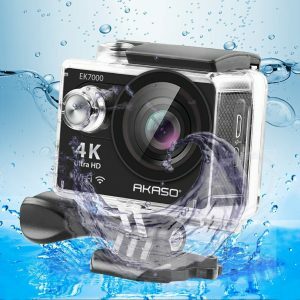 This review shows that the AKASO EK7000 is not the most impressive action camera you will ever use. Hence it is neither a legitimate 4k camera nor is it the best when it comes to video and image quality. 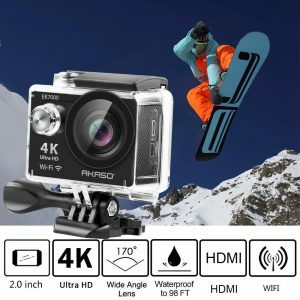 However, if you’re in need of a cheap action camera that does everything you need it to do and is easy to operate, you will not get a better deal than this.